Property 21: Charming And Well Decorated Apartment In The Centre Of The Town, Amazing View ! Property 24: Very cute apartment in the core of Montepulciano and at the feet of the main sq. Property 30: Two bedrooms shining and fresh 140 apartment with free public parking. 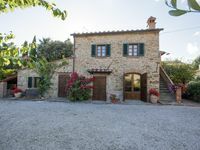 Property 34: Villa PoliFlora is a modern apartment in Monticchiello of Pienza in Tuscany.